Among FireWire 800, FireWire 400, USB 2.0 and eSATA, there's no doubt about which is the interface of choice when it comes to performance—eSATA delivers the fastest data transfers from storage devices with multiple interfaces(1). 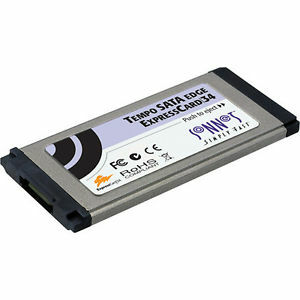 Sonnet's Tempo™ SATA Edge ExpressCard/34 provides fast eSATA connectivity through an adapter that practically disappears inside your computer. Sonnet's smallest SATA host controller features a single external 3Gb/s SATA II port, and supports drive enclosures with port multipliers or hardware RAID controllers. Its small size doesn't mean compromised performance or features—Tempo SATA edge ExpressCard/34 can sustain data transfer speeds to a single SATA drive of up to 110 MB/sec write, 125 MB read, about four times as fast as USB 2.0. You can use most single or dual drive systems, and even popular 4-drive or 5-drive storage systems(2) like Sonnet's Fusion™ D400QR5 or Fusion D500P, to access up to 10TB of storage! Tempo SATA Edge ExpressCard/34 even supports Mac OS® X, Windows® 7 (Professional or Ultimate), Windows Vista® (Enterprise or Ultimate), and Windows XP Pro RAID features, so you can configure your storage the way you want it. Wonderfully small, the Tempo SATA Edge ExpressCard/34 inserts flush inside your MacBook Pro or Windows notebook’s ExpressCard slot so you can store it there when it’s not in use. Whether you carry a small drive to store your files, or simply need access to terabytes of data, Tempo SATA Edge ExpressCard/34 delivers great performance from a really small package.